RRB ALP Technician Eligibility Criteria 2018 – Railway Asst Loco Pilot Eligibility Details: Looking for Eligibility Details for Railway Driver, Loco Pilot & Technician Exam? Railway Recruitment Board has recently issued a recruitment notification for RRB ALP & Technician Recruitment 2018. A very large number of candidates have applied for Railway ALP & Technician against CEN No. 01/2018 vacancies. There are total 27,019 vacant posts available for Railway Technician and Asst Loco Pilot recruitment for the year 2018. Here in this page below, we have provided the complete details for eligibility criteria of RRB ALP & Technician exam. The Following are the eligibility details to apply for the Railway Driver, Technician and Loco Pilot vacancy. Nationality: The candidate must be a citizen of India. Age Limit: Minimum age limit would be 18 years and maximum age limit would be 28 years. For Ex-Servicemen, up to the extent of service rendered in Defence, plus 3 years, provided they have put in more than 6 months service after attestation. By 5 years for candidates who have ordinarily been domiciled in the State of Jammu & Kashmir during the period from 01.01.1980 to 31.12.1989. Upper age limit in case of widows, divorced women and women judicially separated from husband but not remarried shall be 35 years for Unreserved, 38 years for OBC and 40 years for SC/ST candidates. The date of birth for candidates for different age groups, should be between the dates given below: (Both dates inclusive). 1. 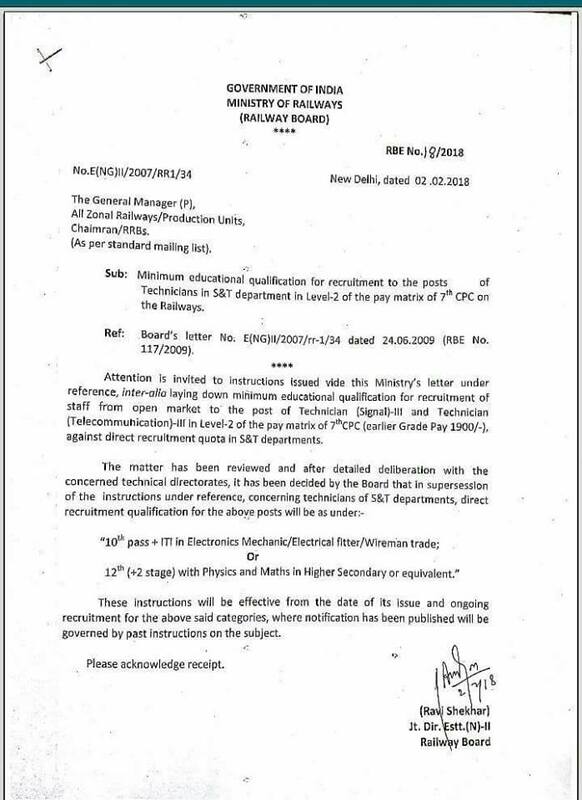 Asst Loco Pilot: Candidates must have passed Matriculation plus course completed Act Apprenticeship/ ITI approved by NCVT/SCVT in Electrician/ Electrical/ Fitter/ Wireman/ Electronics/ Information Technology/ TV & Radio/ Instrumentation/Computer/ Computer Networking/ Data Networking or 10+2 with Physics and Maths (OR) Diploma/ Degree in Engineering. 2. Technician: Candidates must have passed Matriculation/ SSCLC plus ITI/ Course completed ACT Apprentices (OR) or Pass in 10+2 stage in Higher Secondary in Science i.e. Physics or Mathematics for Technician Signal Gr.II. RRB ALP Technician Recruitment 2018.